David Hitchcock's Springheeled Jack plays off of a 19th century urban legend. The tales tell of a mysterious demonic man who stalks and snatches its prey. 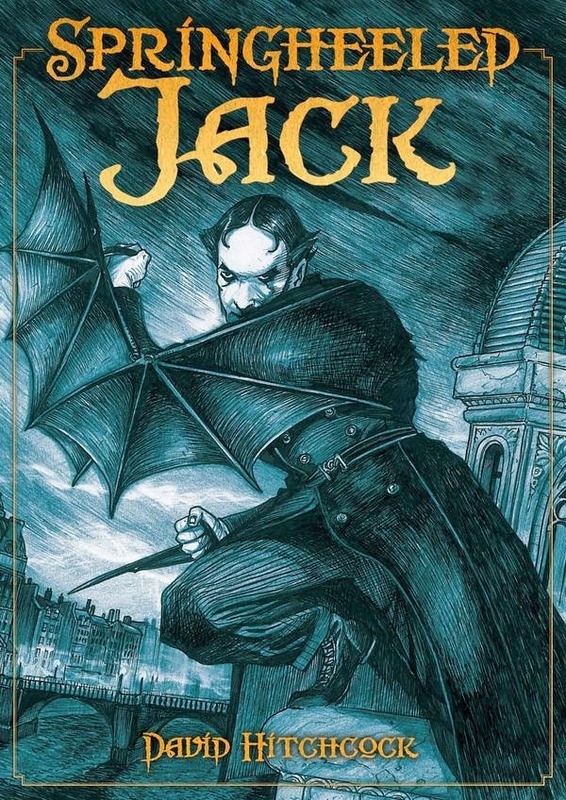 Jack Rackham, a London gentleman, finds his world turned upside down when his wife, Evelina, goes missing. The police suspect him; his former friends abandon him, but Jack knows the truth: the demon scourge of London has taken his wife. He is determined to get her back, no matter what it takes. There is a lot of potential for fun in this story. 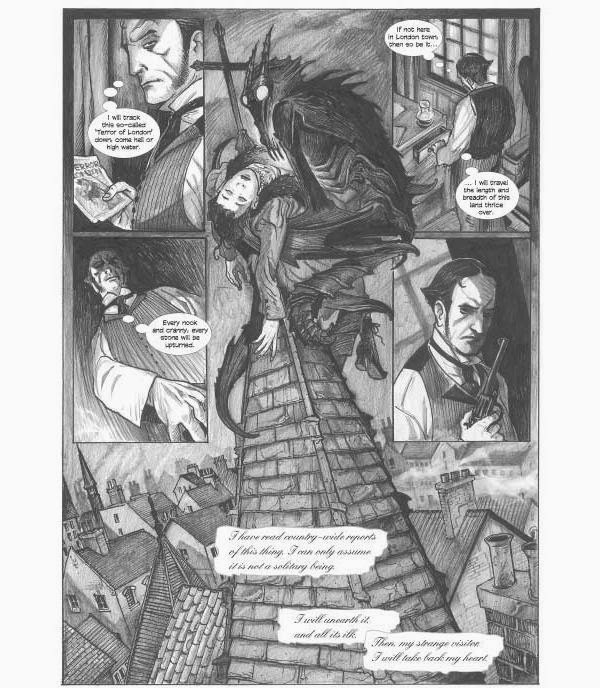 Hitchcock incorporates Penny Dreadful tales and Dr. Jekyll into his plot, using old narratives and an existing literary character. Initially, it's unclear what the nature of the monster is and if the monster is actually real. But it was kind of a let down when that mystery is revealed very early on, and it doesn't help that the characters aren't given a consistent portrayal. I was really hoping to see a confident, and competent, Dr. Jekyll but he's not used that way here. I don't think Hitchcock used Stevenson's iconic figure very well, leaving a lot of storytelling potential on the draft board. But it wasn't just Dr. Jekyll. Some of the characters did or said things that seemed out of place. For instance, one character referred to raising one's glucose levels. While this isn't necessarily wrong, the terminology just sounded odd for the time period, especially because the character wasn't in any type of scientific or medical profession. It would have been in-keeping to use more antiquated phrasing. The art is interesting. I thought the use of pencil sketches and greyscale added a lot of dramatic effect. It was drawn how I imagine an older movie would have been shot, with lots of odd angles and dark facial expressions. It has some angular, tortured looking inmates and evil, buggy aliens. The aliens and their infiltration was very interestingly drawn. There was a steampunk feel to the aliens and a really fascinating presentation of the way that they're taking over. The art also features a lot of rooftop scenes with some broad views of city scape. I thought this was a neat way to tell about the adventure. It made the city feel overwhelming. Occasionally, the drawings took on a slightly-curved panorama quality. This was a bit disorienting, but succeeded in emphasizing some of the vastness of the city. In combination with the grayscale, the city was a smoky-industrialization era creature in its own right. This all being said, Springheeled Jack has a fun steampunky element, some very cool alien creatures, and also some very dramatic battle scenes. Overall, it's not the most masterful storytelling, but it was fun and had some very cool illustrations, so while not a must-read, fans of the genre and rougher art styles may want to take a look.